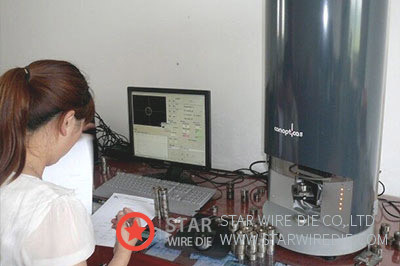 Through many years producing wire dies and service the different materials wire producers, we got so much experience in wire die quality control and know why and where quality problems are easier to happen in wire dies. We pay high attention to the quality of each die we make and all our dies are 100% individually and microscopically inspected under X-100 magnification, any defects even a very tiny crack are completely rejected. Our quality control system requires to check each manufacturing process from materials. Diamond inspection: We individually and microscopically inspect and hand select the diamonds we purchase from reputable suppliers known for high quality stones. Any impurities, cracks and spots can be easily detected and rejected. Die nib orientation: We use a device to mark the center in the casing and die nib is easy to put accurately in the center of casing. Metallic powders sintering and reinforcement for diamond and PCD blank: Sintering is a key process and most breakage of dies is happened due to bad sintering. Our technical know-how or component of metallic powders sintering gives diamond and PCD blank a strong protection and best resistance to breakage, reinforcing diamond and PCD blank to endure wire impact for a longer time and to prolong die life. Our sintering process is accomplished by the combination of an infrared sensor for sintering temperatures and a sintering machine. Laser piercing: The precision and consistency of our die profile are improved dramatically by our state-of-the-art laser piercing machines. Ultrasonic grinding and wire polishing: Die profile like lubrication area (length and angle), reduction area (length and angle) and bearing area (bearing length) are made by the 2 processes, which are so important to die profile good or not, a die is very easy to break if die profile is not good. Our advanced ultrasonic die working machines and finest hand crafted workmanship ensure the accurate die profile and high surface finish. Inspection by microscope and Conoptica ElectroOptical Frame CU10: All our dies are 100% individually and microscopically inspected under X-100 magnification, and most dies are checked by Conoptica CU10 for die profile (reduction angle, bearing length and ovality etc.). The innovative Conoptica quality control system makes it come true: The precision and consistency of die geometry can be regulated to high standards. © 2016 STAR WIRE DIE CO.,LTD All rights reserved.